Visually stunning but also very utile, the Blade Bar Stool Black has a padded two-piece seat built around a chrome plated steel frame. A unique addition to any bar area, the Blade is designed to have a lasting impression on anybody who lays their eyes upon it. Black bonded real leather covers the arched seat and backrest, contrasting with the chrome beneath. Alongside the seat, a triangle footrest further enhances the levels of support and comfort this stool gives, allowing you to sit back and relax. 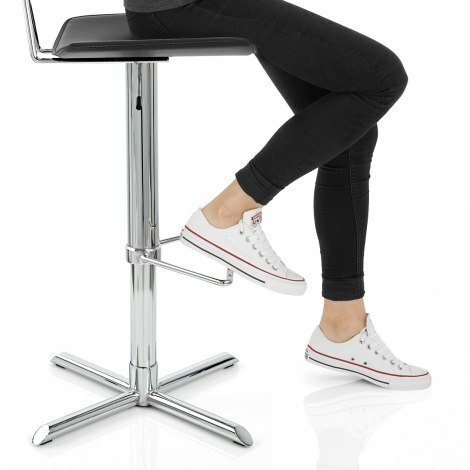 The central stem houses a gas lift mechanism, providing variable height and 360 degree rotation, allowing you to tailor the stool to your needs. Keeping the Blade stable is the base, an unusual cross that gives further detail as well as helping to keep your floors scratch free thanks to the protective pads found underneath. "Beautiful stools. Perfect for our new breakfast bar"
Beautiful stools. Perfect for our new breakfast bar. The visit to your Birmingham showroom was well worth the 200-mile round trip and your staff are very helpful and knowledgeable. The stools were easy to assemble and also remarkably compact so we easily got four packaged stools in the back of the car. We were very careful with our product selection because our floor is engineered oak and we didn't want any chance of the oak ever getting damaged so we would encourage customers to consider that carefully. There's a good range of adjustment on the gas lift and the stools feel like they will last us for years and years. Thank you very much Atlantic Shopping. Ten out of Ten from us. The reason I bought these stool was to iliminate the feet marks and dust from the solid base style. I have not been disappointed they are very sturdy stools and the customer service is excellent would definitely recommend this company. Very pleased with my bar stools. We only have a small breakfast bar so didn't want anything too bulky. The design of the base made it easier for both stools to fit under. Fast delivery service and well packed.